“A unique report by a terminally ill patient from the front line of a deeply dysfunctional hospital system. 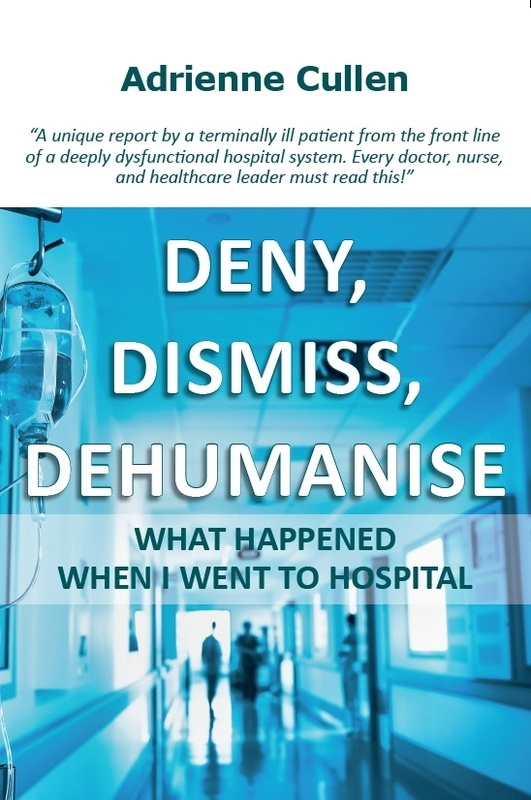 Every doctor, nurse, and healthcare leader must read this!” ONE woman’s shocking battle with the 21st century hospital that killed rather than cured her … her chilling report from the frontline of a medical system struggling to cope with its own complexity … and her campaign against the secrecy surrounding “avoidable medical error” which costs 100,000 lives across Europe every year. This book is written by an Irish woman, living in the Netherlands, cervical cancer patient who became victim of a serious medical error, in 2011, leading to her untimely death December 31 st, 2018, at the age of 58. Her name is Adrienne Cullen, journalist. May she rest in peace. In 2013 her gynaecologist dr Huub van der Vaart UMC Utrecht (NL) told her that he had missed the result of the cancerous tissue test, which showed she had cancer in 2011. For 2 years her cancer was untreated and it would eventually kill her, december 2018, in spite of many treatments and surgeries. In her book she describes the attitude of the doctors and the UMCU hospital. After the calamity was discovered, she was met with the greatest indifference ao by Prof Fauser, head of the department, although after some time her gynecologist Huub van der Vaart and the later head of his department Arie Franx later acknowledged their mistakes and became very friendly with her. “No one was interested. The care staff I interacted with didn’t know about the mistake, and there didn’t seem to be much enthusiasm to investigate.” UMCU had no policy how to deal with victims of medical errors. Her doctor Huub van der Vaart p 16 thought the error had occurred due to the transition to electronic patient files. Her book- 320 pages- is chronologically written covering the period of June 2013 till December 2018. P169 her lawyer told her : hospitals never apologize to patients, they are guided by lawyers and not by compassion. Prof dr Margriet Schneider, new CEO of the UMCU sent her a letter of apology jan 2016. On p 221 Adrienne elaborates on the role of lawyer UMCU Albert Vermaas, who apparently focused on the interests of the UMCU. She describes the lack of contact by Prof. Kit Roes p 89. Slowly her gynecologist Huub van der Vaart and the new head of the department Prof. Arie Franx came to the conclusion they had to support Adrienne as a patient and human being and this led to an exceptional warm relationship with them and they were forgiven by Adrienne. Dec. 2015 she was impressed by Arie Franx ‘honesty and decency to help her p 135, 252 232. Franx and Adrienne stopped being adversaries June 2016. This is very very exceptional. Most doctors abandone their victims of medical errors and impose the wall of silence, no info, no diagnostics, no remedial medical care…..in spite of their duty of care. They view the victim as a potential litigant and “forget” the patient is a human being, who needs help. 2. a description of all her medical treatments, after her cancer diagnosis, in several other hospitals for five years. Adrienne describes the many surgical treatments, radiotherapy and chemotherapy and the attitude of doctors and nurses, including another error, which she could prevent by being alert and assertive. She elaborates on various occasions where nurses from different hospitals where she was treated, reproached her and subjected her to unpleasant comments for not speaking Dutch. Adrienne also discusses the uncertainty about the cause of the error, the transition to electronic records, pages 11, 16, 17, 36, 74, 82, 91, 95, 96, 123, 130, 131, 133, 230, 249, 286 en 291, which van der Vaart and Franx indicate as reason but vehemently denied by Jan Kimpen. The UMCU proved exmremely reluctant to investigate the medical error. Only in 2018 the UMCU agreed to do a root cause analysis and April 2019 the results are not published yet and Adrienne sadly passed away, never knowing the results of the investigation. She describes the meeting with ao CEO Prof Jan Kimpen beginning of July 2015 who said he would deal with the matter urgently, went on holiday and never contacted her again….p 85. Prof Kimpen was awarded a knighthood p. 225 and got a prestigious job at Philips. She describes that the Inspectorate of Healthcare IGZJ never returned her call in 2014 p 94. Shockingly, it became obvious that nowhere in the UMCU hospital records the grave medical error was registered!! !, p 96 an experience shared by thousands of other victims of medical errors, and a gross violation of the duty of information, registration and care of doctors. Her lawyer put her in contact with Prue Vines visiting professor in the Netherlands summer 2015 p 99, and Prof Vines sent a 4 page letter to UMCU about the necessity of open disclosure to Adrienne. Peter Cluskey, her husband, journalist at the Irish Times started publishing tweets social media to expose wrongdoing of UMCU which indeed started to feel very uncomfortable. Adrienne came to the conclusion that it was necessary to sort the financial compensation issue out themselves p.103, as she discovered that Dutch lawyers stick to general agreements on financial limitations, which are not in the interests of their clients. Adrienne mentions the Zembla television broadcasts, November 2015 about deaths patients at the ENT department UMCU and the heroic role dr whistleblower Wreesmann p 109. Also these calamities were no reported at IGJ, as was ignored as well in the case of Adrienne. She writes how Peter and she did not accept the gagging clause by UMCU, she describes the negotiations and the fact that Mrs Edith Schippers Minister of Health also opposed the gagging clause. In order to put pressure on the UMCU Adrienne approached a prestigious Dutch newspaper NRC, which published a huge article November 20, 2015 p 126, convincing the UMCU to pay out 545.000 euros and abandoning the gagging clause. The payment is exceptional and exceptional high and probably influenced by the fact that Peter her husband is a journalist for the prestigious newspaper Irish Times. Most victims of medical errors are totally abandoned , no info, no care, no compensation!!! She mentions the responsibility of the pathologist to call the doctor who did the examination but ….the pathologist did not call. Adrienne choses to be silent on the name of the pathologist. SIN-NL has put Prof Dr. Paul van Diest, head of the pathology department on zwartelijstartsen.nl a blacklist of negligent doctors, online with the permission of a Dutch court 2009. January 2016 Helene van Beek a Dutch journalist published that Belgian prisoners were asked to assist in the transition process form paper to electronic records. June 2016 p 228 248. A day later the UMCU announced finally that they would start an investigation of the medical error. Adrienne stressed the fact that every patient has a fundamental right to know what went wrong. It is noteworthy that Adrienne mentions frequently the phenomenon of Post Traumatic Stress Disorder, caused by her desastrous experiences as a victim of a most serious medical error. December 10th, 2018 three weeks before her death 31 December by euthanasia at the Netherlands Cancer Institute in Amsterdam, her alma mater the University College of Cork conferred her with an Honorary Doctorate of Laws from the National University of Ireland. Adrienne is a truly professional writer. Her book is an important description of the attitude of the UMCU hospital, after the medical error and her experiences in other hospitals. This is a must read for all who work as professionals in hospitals, nurses, doctors, managers, but also for patients to be aware of the dangers in hospitals. Last but not least SIN-NL advises all patients always to demand a copy of the results of examinations and a full copy of your medical records, this is a basic patient right, formulated in the Dutch law WGBO. This can prevent major medical errors.